The above quotation forms the heart of this fast moving, hard-hitting, inspirational self-leadership book in which Col. Hubbard shares the valuable lessons he learned during 2,420 days as a prisoner of war in North Vietnam. Based on his experience as a POW, Col. Hubbard takes the most negative situation you can imagine and turns it into one of the most positive personal growth transformations you will ever read. His message is for everyone in any walk of life. This is a "must read" book in the tradition of Man's Search for Meaning by Viktor Frankl. Beyond helping him survive as a prisoner, Col. Hubbard’s discovery of “The Wonder of Human Potential” helped him achieve success following his release from prison. In the first seven years following his return to the United States, he completed all requirements for five college degrees in his spare time. 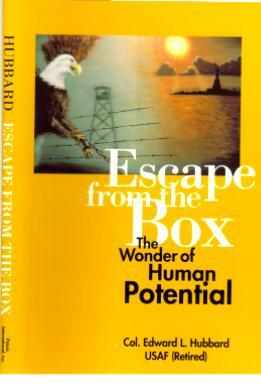 Col. Ed Hubbard wrote Escape from the Box to help others overcome any obstacle, survive any ordeal, and reach any goal by developing the right state of mind. Copyright 2008 by Praxis International, Inc.